Need Help Getting Stable from IBS Attacks? 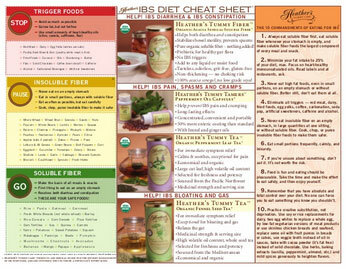 Get The IBS Diet Cheat Sheet! Go straight to the heart of this site with Heather's IBS Diet and break the cycle of Irritable Bowel Syndrome today!. Skip to the printable IBS diet chart cheat sheet. Or, take immediate control of your IBS symptoms with the IBS Diet Kit. Do you have IBS (Irritable Bowel Syndrome)? You're not alone! You may feel like you're the only person in the world with Irritable Bowel Syndrome (IBS). You're not. Living with IBS does not mean suffering in silence or just enduring the misery. This site offers IBS information, support, and immediate tangible help* for all Irritable Bowel Syndrome symptoms. We're the largest IBS organization and IBS community on the internet, with over 250,000 subscribers - welcome home! IBS - What Is It? Irritable Bowel Syndrome? Spastic Colon? IBS, or Irritable Bowel Syndrome (also known as spastic colon, and sometimes improperly termed spastic colitis) is a devastating and incurable condition that afflicts up to 20% of the world's population. It is the most common chronic health disorder in America, Canada, the UK, Australia, and New Zealand, affecting more people than asthma, diabetes, and depression combined. If you're confident that you've been properly diagnosed with Irritable Bowel Syndrome, there are several key strategies to successfully manage the disorder. Irritable Bowel Syndrome Symptoms - What Are They? How is IBS Diagnosed? It's important to verify that your symptoms match those of Irritable Bowel Syndrome before you accept this diagnosis. As noted, IBS is characterized by continuous or recurrent lower abdominal pain or cramping (from mild to excruciating) in association with altered bowel motility (diarrhea, constipation, or both). IBS attacks may strike suddenly at any time of day or night, and may occasionally - though not typically - wake you from a sound sleep. Gas and bloating are common, but vomiting isn't, though it can occur due to nausea from the pain. Upper GI symptoms are not a typical part of Irritable Bowel Syndrome. For women, IBS attacks are often associated with menstruation. Passing blood, running a fever, swollen extremities, and joint pain are not symptoms of IBS, and point to other disorders. IBS is diagnosed in part by the use of the official diagnostic criteria known as the Rome Guidelines for Irritable Bowel Syndrome. If you're confident that you've been properly diagnosed with Irritable Bowel Syndrome, there are several key strategies to successfully manage the disorder. Once you have a firm IBS diagnosis: eating for IBS is about knowing what foods not to eat much as what foods to eat. Learning trigger foods, soluble fiber versus insoluble fiber, and how to eat for IBS will help you maintain a healthy diet that also directly manages your IBS symptoms. The fundamental idea of eating for IBS is to avoid the IBS trigger foods that trigger or irritate a spastic colon via the gastrocolic reflex that occurs when food enters the gut. Yes, you will probably have to completely eliminate some trigger foods from your diet. But, many triggers have safer substitutes, and there are quite a few tips and tricks to learn for cooking with nutritious trigger foods in an IBS-safe manner. It's not just WHAT you eat for IBS but HOW you eat as well. As you've probably learned from painful experience, sometimes a food will bother your IBS, and sometimes it won't. This seems crazy but actually, it's not. Foods can soothe or aggravate IBS symptoms, and prevent or trigger IBS attacks, depending on how they physically affect the GI tract and gut motility. This is why HOW you eat really matters. The 10 Commandments of Eating for IBS give the guidelines, tips, tricks, and substitutions you need to know for how to eat for IBS. It's not just about IBS trigger foods to avoid, it's about having IBS safe foods that will actively help prevent symptoms in the first place. This is where a special kind of fiber is key. You've heard of fiber, you're pretty sure you know what it is, and you've probably had it recommended to you as beneficial for IBS. But what kind of fiber is critical. Soluble fiber foods are the IBS safe foods, and you want to make these safe foods the basis of all meals and snacks, day in and day out, to keep your gut motility stable. Focus on your IBS safe foods. What's the number one thing IBS recipes have in common? They're delicious! Cook according to the IBS diet guidelines and you can enjoy almost any type of food. You'll start with the IBS safe food list of high soluble fiber foods, keep recipes low fat, avoid IBS trigger foods, and carefully add insoluble fiber foods. If you think this diet sounds too scientific and intimidating, relax. It's easier than you think. Have hope, you can manage IBS symptoms successfully for IBS relief! If you're still wondering what exactly Irritable Bowel Syndrome is and whether or not you have it, it's important to see a physician. IBS cannot be self-diagnosed, as there are many other disorders that can mimic Irritable Bowel Syndrome symptoms and must be ruled out by clinical tests. If you have a firm IBS diagnosis, a very reassuring place to start is with what IBS patients need - but don't get - from their doctors. As a rule, all possible physical, structural, and infectious abnormalities of the GI tract need to be unquestionably eliminated before you agree to an Irritable Bowel Syndrome diagnosis. This requires a physical examination, preferably by a board-certified gastroenterologist. The medical tests needed to rule out disorders other than IBS will depend upon your age, health history, family health background, and specific symptoms. Once you have a firm IBS diagnosis, take heart. While there is no cure yet, there are many ways to successfully manage - and prevent - all Irritable Bowel Syndrome symptoms. You can control your IBS, not vice versa. To start feeling better immediately, begin with the Irritable Bowel Syndrome diet and learn why how you eat is just as important as what you eat. For tangible help, shop for IBS-specific products at Heather's Tummy Store. Follow the latest IBS news and events here! These help my nervous stomach so much.I don't eat when I first get up and i take one of these and its stops my stomach from churning and coats it so it doesnt hurt. Really helps deal with gas problem.